White in color and bearing all the princely ornaments and crown, he will always be represented in the form of sambhogaya, translated as “Glorious Form”. Vajrasattva belongs to the family of Akshobya. Some believe that he is an emancipation of Vajradhara, while others will regard him as the patriarch of the 5 Dhyani Buddhas. Buddha Maitreya is considered to be the Buddha that will come after Shakyamuni Buddha, and is often represented as a Boddhisattva. There are numerous ways to represent him, and we will analyse one of the most common Thangkas and take a closer look at the story of Asanga, Maitreya and the dog. Considered as the personification of the combined Wisdom (Prajna) of all the Buddhas. It is common to see Buddhist scholars reciting his mantra in the morning, and there are many legends of beings with exceptional intelligence following their devotion to Manjushri. By Samsara (bhavachakra) we are talking of all existences that are conditioned by: ignorance, suffering and the unexplainable flow of time, often represented by Yama holding the wheel of life. Nirvana, on the other hand, represents the world unaffected by negative emotions, which by definition is the nature of happiness. 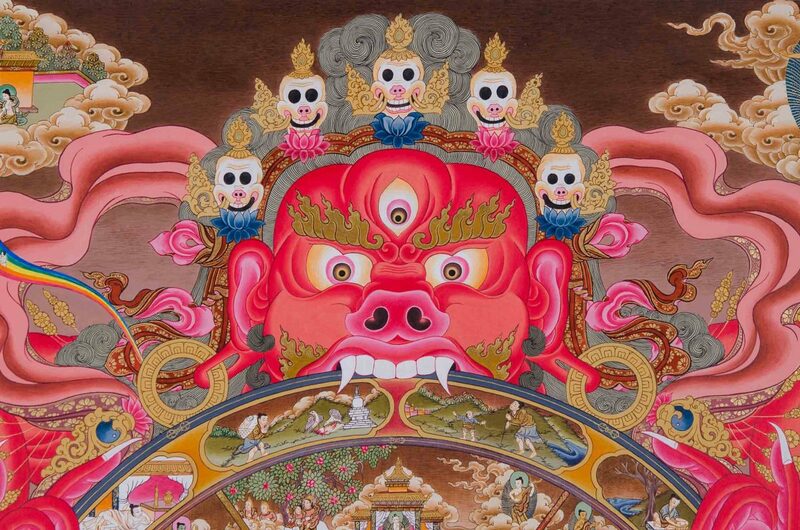 This deity is one of the most popular divinities originating from Tibet. Regarded as Tibets guardian deity where he is known as Chenrezig. He is considered to be embodiment of the compassion of all the Buddhas and is easily recognised by his 1000 arms.